Shavari, a Khajiit elemental mage, is a Thalmor agent who has been tasked with killing you in Riften. While in Riften she will follow you around. If you attempt to talk to her while in Riften she will simply brush you aside and say: "Pff. Go away, if you know what's good for you." 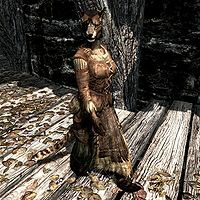 Once you have found Esbern she will throw off her disguise and announce: "And now you pay for meddling in the Thalmor's affairs." She wears clothes and boots and carries a note detailing the task she has been set, along with an elven dagger. Another female Khajiit named Shavari is mentioned in the Oblivion quest Whispers of Death as requiring the Dark Brotherhood's services. This page was last modified on 19 August 2015, at 15:45.